Note: Sorry, mutts—Chasing jackrabbits through the desert is not allowed. All trails require dogs to stay on a leash. When the temperatures rise, be aware of your dog&apos;s safety. Dogs are prohibited on all City of Phoenix hiking trails when the temperature is 100 degrees or warmer. This well-maintained 1.9 mile hike through the White Tank Mountains offers easy activity for you and your pup. With an abundance of rocks to clamber over and a shallow pool perfect for a dip, dogs and owners alike can engage with the scenery (although only the humans might appreciate the ancient petroglyphs located throughout the trail). Parking at this regional park is $6. 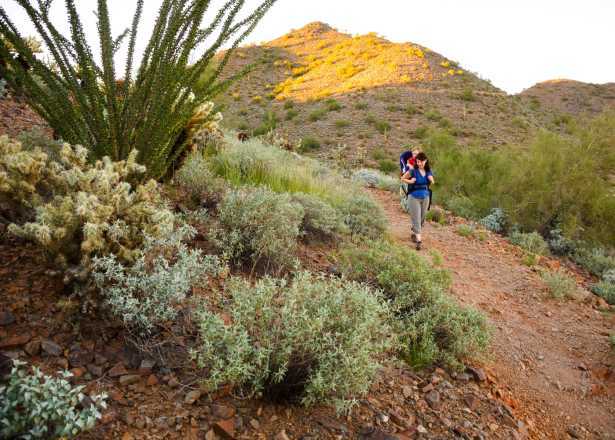 Rated as a moderate hike, this rocky trail loops through Cave Creek Regional Park and features impressive landscapes, blooming wildflowers and a forest of towering Saguaro cactuses. The incline makes it a desirable workout for trail runners, if you and your dog are up for a 5.9-mile race. Expect to pay $6 for parking. Don’t let the name scare you away from tackling this trail: Follow the path and keep your dog leashed, and neither one of you will have to worry about getting lost. 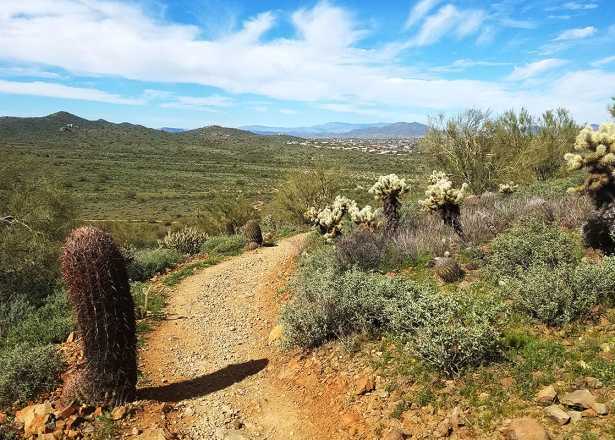 The Lost Dog Wash Trail offers a scenic stroll through a natural desert wash, and is suited for hikers of all skill levels and their pets. Fill up on water or rest your paws under shade ramadas at the trailhead facilities. 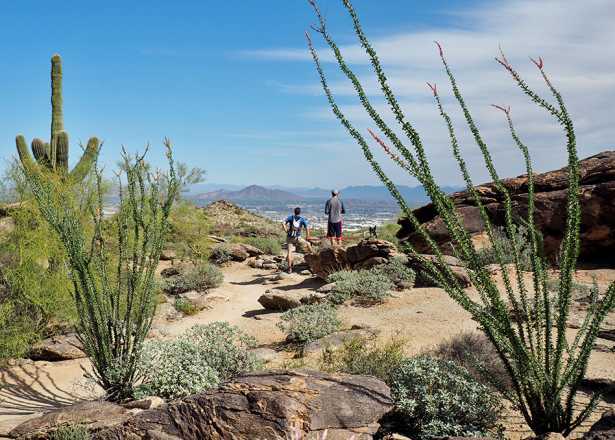 Located in the country’s largest urban park, the Hidden Valley trail (accessible from Mormon Trail) boasts an exerting climb, gorgeous views of the valley, fascinating rock formations and tunnels, petroglyphs and an awesome photo opportunity at Fat Man’s Pass. This narrow passageway between two large, granite boulders dares hikers to try and squeeze through. If you or your pup won’t fit, there is a way around as well. This short (but sweet) 1-mile summit trail is a local favorite. Lookout Mountain features beautiful desert scenery without the large crowds you may find at nearby peaks. With a steady incline from start to finish, this trail is great for hikers and their canines looking to get some quick exercise without sacrificing the stunning views. O.H.S.O offers the best of both worlds for dog owners: Spent grain from the restaurant’s craft brewing process at the Arcadia location is used to make homemade biscuits, so you and your dog can essentially enjoy the same treat while you kick back on the patio. The locations in Phoenix, Scottsdale and Paradise Valley are all beloved with pet owners enjoying craft brews, great happy hour deals and the company of other fine four-legged friends. For the humans: Monday or Tuesday after 8 p.m., get any house bottle of wine plus a board of bruschetta for $20. For the dogs: Pleasant smells, endless water bowl refills and plenty of affection. 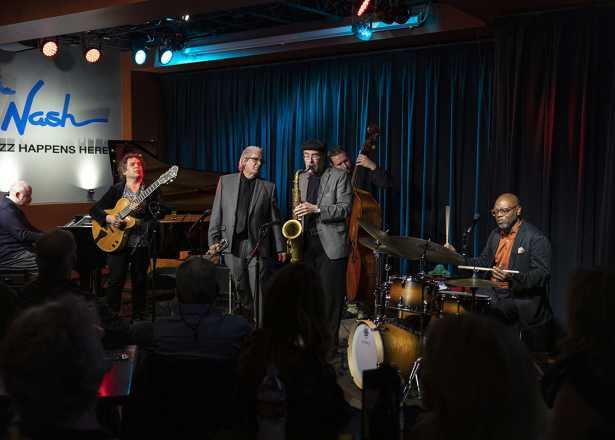 Postino has five dog-friendly locations throughout the Greater Phoenix region, all occupying trendily restored neighborhood buildings and offering Italian-style favorites. Pop in for a Neopolitan-style pizza, and enjoy a lush patio experience under the trees and globe lights with your dog. The ambiance and wine options will encourage you to stay a while in this slice of urban respite. This brunch spot not only embraces your pet on the patio, but has developed a menu for them: While you&apos;re digging into "dream" omelet, waffles, eggs bennie and the rest, your pooch can choose from a lean chicken chow hound scramble, pup cakes pancakes with sausage gravy, and doggie biscuits. The namesake of this brewery was a well-traveled lab mix named Bear, and the restaurant itself is an ode to his favorite hangouts to relax after being on the go - garage, backyard and kicking back at home. You&apos;ll find milk bone-shaped tables, a fittingly pet-friendly patio and locally brewed craft beer (plus a big menu). Your furry friend may not understand your love of mimosas, but we do. 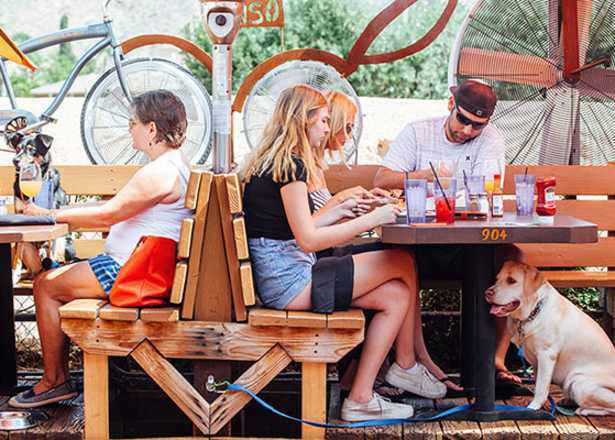 Enjoy brunch at this local community gathering hotspot on their shady dog-friendly patio, which features a water station to keep dogs hydrated. The restaurant’s proximity to the Phoenix Mountains Preserve makes it a great spot to refuel and refresh after a hike. If you’re in the mood to soak up some sunny weather on a picnic, skip packing your own lunch and let The Farm Kitchen provide a fresh basket of food and scenery. Leashed dogs are welcome to sit with you in the farm’s pecan grove. Don’t skimp on dessert –the pecan pie is made from-scratch from the grove. 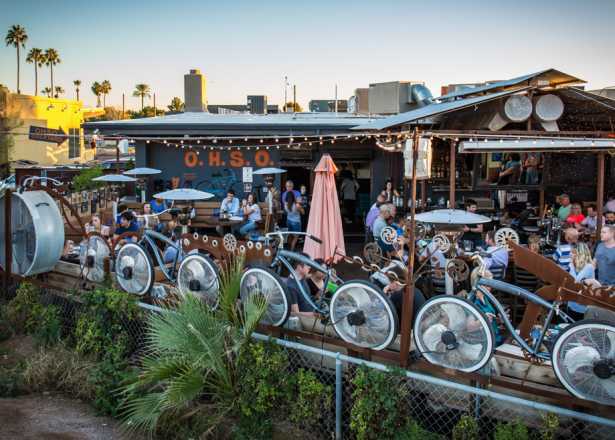 This Tempe brewery is fresh from a remodel and boasts a massive patio. And what would a proper hangout spot be without the dogs? Enjoy some canine company in the dog-friendly area, play yard games, warm up at fire pits and enjoy the menu of food and craft beer. They even sell their own branded dog collars with a built-in bottle opener (now, that’s man’s-best-friend material). Nestled in the 12-acre Agritopia community and urban organic farms, Joe&apos;s Farm Grill features harvest from fruit, veggies and herbs grown outside its doors. The menu is stacked with fresh takes on comfort foods such as hot dogs, burgers, chicken sandwiches and grilled pizza. Tip: Hit up nearby Cosmo Dog Park first, then bring your pup to relax in the grass here. Satisfy a hankering for pretzels, schnitzel and bratwurst at Historic Downtown Glendale&apos;s Haus Murphy, where authentic German fare is the claim to fame. If you opt for the outdoor table seating in the Biergarten, your dog can join you. Ask for a sausage for them! Take your friend for some fresh air and a swim at Cosmo Dog Park. Named after Gilbert’s first police dog, Cosmo’s signature feature is a large lake perfect for cooling off and chasing down water toys. The 17-acre park also features four separate fenced areas, some with agility structures, and two washing stations to get pets clean before the car ride home. Don’t forget towels. Located just north of Indian School Road in Central Phoenix, Steele Indian School Park is a great option for downtown dwellers. This park covers 2.5 acres of land and features amenities such as solar night lights, drinking fountains inside the off-leash areas and cute paw-shaped pathways. 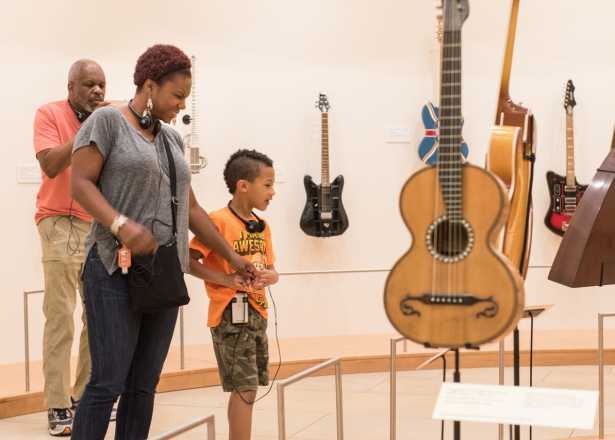 There are plenty of ways for you and your pup to explore Papago Park. You can keep the leash on and hit the trails that cross inside and around the distinct red butte formations, or choose to let your dog run free in the gated off-leash section located at the corner of College and Curry. Let your pet run free with like-minded friends in this 3-acre park’s designated active dog or passive dog areas. The sections all feature grassy lawns, benches, shade trees, water fountains and play structures. It’s a popular park, but the generous size gives pups some space to meet and greet, and is perfect for playing fetch with long throws. Grab a Frisbee and head on over to Paseo Vista Recreational Area. The dog park’s large size and clean grounds make it a local favorite, and suited for dogs of all shapes and sizes to enjoy some running room. If you’re looking to stretch your legs too, the nearby Consolidated Canal pathway is accessible from the park. 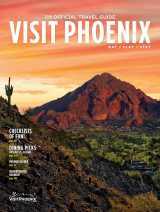 Craft beer, waterfalls, a bat cave and more: They&apos;re all in a day&apos;s walk along Phoenix&apos;s canals.